Buyers can purchase a Linssen Yachts Grand Sturdy 380 AC presented in excellent condition. Built in 2002, she measures 11.60×3.85×1.15m. Powered by a single Volvo Penta TAMD 31 100hp engine. Mosquito screens in dropping windows. Linssen bed covers and soft furnishings. grey water tank, pump and level indicator. 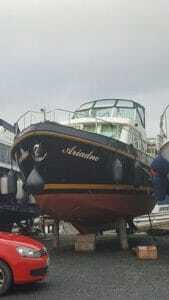 She is a very clean high quality vessel being offered at a reasonable rate.